Coaster Photo – Community activist Tyrone Laws spoke to Asbury Park students recently about having goals and working hard. 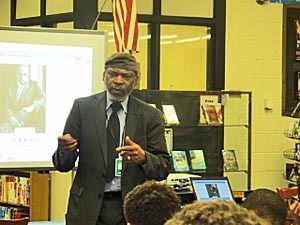 Work hard, don’t be discouraged and respect those who love was the message Community Activist Tyronne Laws brought to Asbury Park High School students during a recent program. The program “Understanding and Respecting Your Culture” touched on a wide range of topics during a slide show of prominent African Americans. As he went through the program which included Wilma Rudolph, Malcolm X, Barack Obama, Hank Aaron, Laws frequently pointed out to students that these luminaries started out as teenagers just like them. “They realized something inside of them when they were your age,” he told them. The event was organized by the district’s College and Career Readiness Center Brian Stokes and was part of a week long series of motivational speakers who made presentations at the elementary school, middle school and high school. Laws offered several life lessons including not letting others define you and ideas and conduct are everything. He also reminded students that their elders, parents and grandparents worked hard to raise them because they love them. Genise Hughes of the CCRC said the program is an attempt to give elementary school students insight into possibilites. “We want to show them positive activities, catch them before they get involved in other things,” she said. On a modern note Laws told them about the invention of the double turnstile with a toggle switch that was used in the making of many Hip Hop songs. “That’s the way mixing got started,” he said. He was an electrical engineer, “we should always be refining what we find,” he said. When no one knew who the group was, he told them to Google it and come up with the answer before the session was over. Laws also spoke of the origins of the human race which began in Africa, citing Lucy whose remains were found in Kenya. One slide showed Mohammed Ali talking a suicide victim down from a ledge on a tall building. “There is a way for speech to be so good it changes outcomes,” he explained. He asked students to ponder three things when making personal decisions. “Is it beneficial to me, is it beneficial to my family, is it beneficial to my community,” he told them. He asked freshmen when they will graduate. They answered 2019. He also spoke of the civil rights movement and the challenges facing Blacks before 1955 when he was 11 years old. He said in the segregated south African Americans would rely on the Green Guide, which told them which restaurants, homes or businesses would be friendly to them as they traveled.